Best known for their speckled coats and striking eyes, Australian Shepherds are a highly popular breed. For many, their gorgeous looks and protective native make them seem like a very attractive breed to own. Australian Shepherds might look like gorgeous dogs, but there’s actually a lot that goes into caring for these energetic dogs. Here’s everything you need to know about Australian Shepherds. Many people think that Australian Shepherds originate from Australia but this is not the case! This breed actually comes from the US, although the ancestors of Australian Shepherds likely came from across the globe. The reason they’re known as Australian? This is probably because of the popularity of Australian sheep in the US in the early 1900s — a breed that Australian Shepherds would herd. 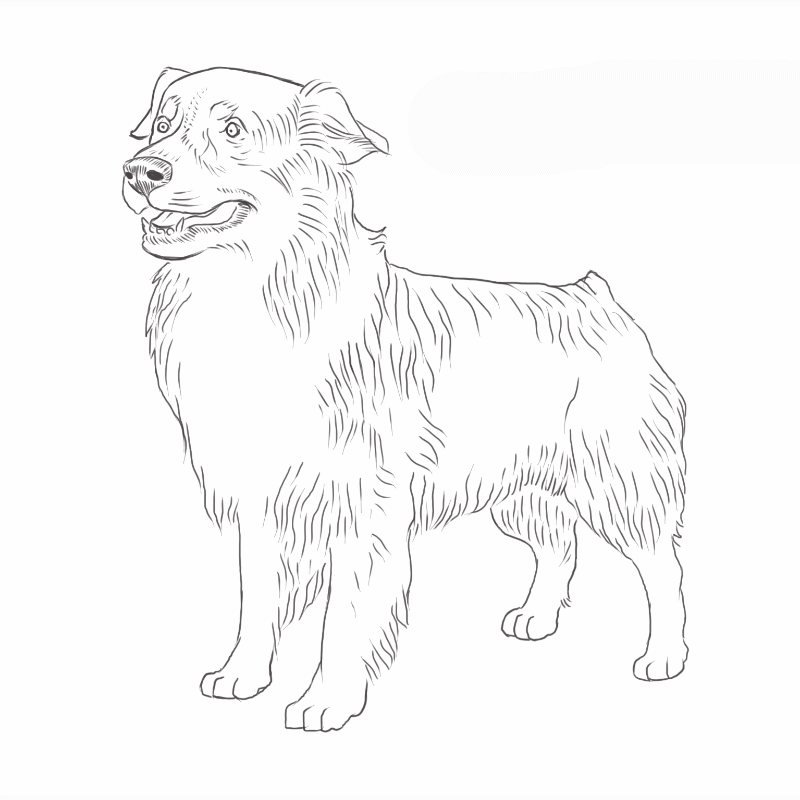 Many agree that Australian Shepherds most likely a mix of Pyrenean Sheepdogs and several other herding dogs. These Spanish Sheepdogs came from a region known as Basque in Europe, somewhere between Spain and France in the rolling hills of the Pyrenees Mountains. Some people think that there’s also clearly Collie DNA in the Australian Shepherd — you only have to look at both of their coats to see the similarities. There are also many arguments for other dogs thrown into the mix with this breed — for example, some believe that Australian Shepherds are in part descended from a breed of dog called German Tigers, known today as Australian Koolies. All of these dogs most likely accompanied shepherds who immigrated to America in the 1840’s during the gold rush. While the origins of this breed may be unclear, what is clear is that Australian Shepherds are a strong mix of herding dogs. It’s likely those who immigrated to the US in the early 19th Century took with them only their best sheepdogs, and the resulting mix of all of those dogs was the Australian Shepherd, which first appeared in the 19th-Century in California. Because of their breeding, Australian Shepherds fast became renowned for their high energy, endurance, and herding abilities. It wasn’t long before they were fully ingrained into livestock handling across the US. Aussie pups are well known for being ‘easy puppies’ to handle but it’s important that you make sure you’re giving your Australian Shepherd the appropriate level of care as they age. Here’s a closer look at how to care for your Australian Shepherd. As with any breed of dog, you’ll want to make sure your Australian Shepherd is eating the right kind of food. In general, Aussies weighing about 50 pounds need around 1400 calories a day as a minimum but you’ll find that growing puppies and those with more of an active temperament need more food for fuel. Protein: It should go without saying that your dog needs protein. Some people recommend at least 10% of the calories in an adult dog’s diet should come from protein, with puppies needing more protein. Fats: This is especially important for high energy dogs. In particular, owners should also seek out omega-3 and omega-6 fatty acids to keep their coat healthy. Carbs: These aren’t as important as fats and protein but they can be a source of energy. It’s important to get the right balance and avoid excessive carbs as these can often be present in dog foods and are no replacement for protein. Some Aussies have food allergies, so it’s also important to pay close attention to what you’re feeding them. Grains are by far the most common type of food that could cause an allergic reaction. The symptoms of allergy can seem quite similar to fleas — they include itching and scratching that can cause hair loss. If you have a good flea removal regime in place for your dog it could be time to examine their nutrition. Australian Shepherd grooming shouldn’t be an ordeal. As a natural adventurer, your pup is going to get covered in the kind of mud and grime that accompanies their active outdoor nature. There’s no reason to balk at the idea of grooming them, though! Brushing your dog is the single most important grooming you can carry out. Your Aussie is going to pick up much more besides mud — twigs and insects for a start — so regular brushing can really help keep them in top condition while ensuring boat their coats (yes, Aussies have two coats!) avoid matting. When you brush your dog you’re spreading their natural oils, which in turn smooths their coat, while you help them with their shedding. Some carry this out daily, while others do this on a weekly basis. The regularity of brushing should match your dog’s coat and needs. As for bathing, like any dogs, the amount you bathe them should be determined by their lifestyle. For a working dog a bath once every 2-3 months is more than enough. Bathe them more than this and you risk drying out their skin too much. Because Australian Shepherds are natural herders, meant for livestock, the primary focus of your care needs to be in making sure they are mentally and physically stimulated. Although you don’t need to go out and buy a herd of sheep for your Aussie, you will need to keep them very busy. In many ways, this makes them the perfect adventure dog. Australian Shepherds are high energy dogs with incredible endurance, so they need plenty of exercise and training. We’re talking 30-60 minutes of high-intensity exercise a day as a minimum for this dog — think chasing a Frisbee long distances or fast runs in the park. Some owners find that taking their Australian Shepherd swimming is an ideal form of exercise too. A bored Aussie might become destructive in the house or even start barking loudly, so it’s important to identify suitable exercise for them early on in your relationship. Intelligent dogs do not always make for easy training — Australian Shepherds are no exception. Being a highly intelligent breed of dog, Aussies can be challenging for first-time owners to train. But, because of their instinct for work and interest in mentally challenging activities, with the right hand at the tiller, many Australian Shepherds can be highly trainable. You’ll quickly find that your Aussie is highly individual — in fact, all Australian Shepherds are super variable with their temperament and even their drives. It’s important to take into account their personal preferences when training your Australian Shepherd. While some Aussies are eager to please their owners, others can be stubborn and aloof when it comes to commands. Early Socialization: As natural watchdogs — these dogs will bark at strangers to protect you — you need to make sure you socialize them with people from an early age if you want your Aussie to be happy around new people. Aussies tend to like their own people but are naturally reserved around strangers. Off-Leash Training: Aussies were bred to chase, so their natural herding instincts are never far away when they’re off the leash. To make sure its safe for them to go off their lead you will need to teach them to come back when called. Chew Training: Australian Shepherds can be a menace for your shoes and anything else that’s chewable! While this can be avoided by offering them the right mental stimulation and challenges, you may also want to train them with chew toys to ensure your entire wardrobe isn’t destroyed. General Training: Aussie’s herding instincts can sometimes cause them to have dominance issues in the house. An important point to remember when training your Australian Shepherd is that they are problem solvers, and this has positive and negative implications for your training. Being highly thoughtful dogs it’s possible to train Australian Shepherds to an advanced level with the right techniques. However, it’s important that when training an Aussie pup you understand their thinking patterns. As independent thinkers, Aussies will take opportunities that many other dogs will not — they will jump over a fence rather than sit behind it and search through your cupboards, even open bags, rather than wait to be fed. With this in mind, your training needs to be as sophisticated as their intelligence. Australian Shepherds tend to be a fairly healthy breed. Because of their love of the outdoors and adventure, they are generally very fit dogs. They have an average lifespan of 13 to 15 years and with the right care are generally exceptionally healthy dogs. All purebred dogs come with a selection of conditions that are more likely to occur in that breed. Hip and Elbow Dysplasia: This is sometimes difficult to pinpoint because it may not physically present in your pup until later life when they could have arthritis as a result. This is a malformation of bone in the joint socket of your dog that wears away at bone, eventually leading to arthritis if untreated. Because it’s often hard to know whether this exists in your dog just by looking, your Vet should perform routine x-rays checking for this condition from around about the age of two years. Eye Conditions: Including cataracts, which is the most common genetic eye condition that Aussies tend to have from a mutation of a gene called HSF4. While cataracts can occur for non genetic reasons such as injury, it’s estimated that HSF4 is responsible for around 70% of cases in Australian Shepherds. If Aussies do inherit cataracts it will occur in both eyes (although not necessarily at the same time). Epilepsy: Australian Shepherds have higher tendencies towards seizures than average often linked to epilepsy. The Australian Shepherd Health and Genetics Institute (ASHGI) rate epilepsy as one of the most common serious genetic disorders for the breed. If you think your dog has epilepsy there is medication that your vet can prescribe to help with this. If this happens, for most dogs the onset will be any time from six months to 2 years old. Australian Shepherds were bred to work. They’re incredibly agile, intelligent, and high energy dogs. This dog is not going to suit you if you don’t have the ability to maintain their active lifestyle outdoors. While Aussies can thrive in cities, their need to exercise means they’re not ideally suited for apartment living. Your Aussie isn’t going to wait around for somebody else to fix a problem. You’ll find that when they are faced with a challenge, they will find the opportunity to fix it for themselves — even if this means unzipping your bags in a hunt for food. When you have a working dog around machinery and livestock, tails can sometimes get in the way. To avoid injury to their dogs, old time Shepherds would either dock their dogs’ tails or attempt to breed this trait out of their dogs. While docking is no longer common, because of selective breeding around 1 in 5 Aussies are born with a naturally bobbed tail and show dogs are expected to have either docked or naturally docked tails. Australian Shepherds can often have two eye colors, known as heterochromia. A nickname for this breed was once the ‘ghost eye dog’ because of their distinctive eyes and the belief that their looks held power. Most people think their eye color is linked to their merle (speckled) coloring but regardless of origin it’s what makes them such an unmistakable breed to look at. Australian Shepherd Origin: Where do Australian Shepherds Come From? Do Australian Shepherds Have Tails? Do Australian Shepherds Like to Swim? Do Australian Shepherds Need Haircuts?